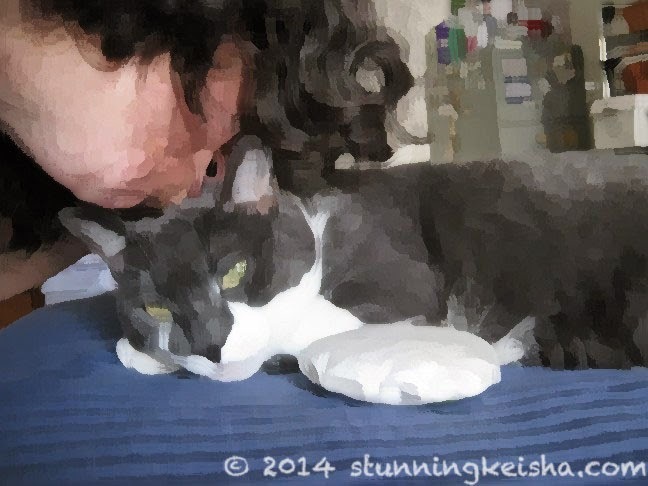 Stunning Keisha: Shocking Selfie—CK Violated! I apologize to those who have seen this post in TCC. It’s not like I take a new selfie every day. Selfie is this week’s PhotoHunt theme. CK: Is this thing on? OMC, What was that flash of light? TW: I was uploading photos to the computer and there’s one I don’t remember taking. CK couldn’t have possibly taken this of herself, could she? Can you believe TW actually had the onions to take a selfie with me! GASP! Not only with me but kissing me! DOUBLE GASP! She violated me! Then she posted it on her FB page and dared me to share it. I’ve never backed down from a dare. 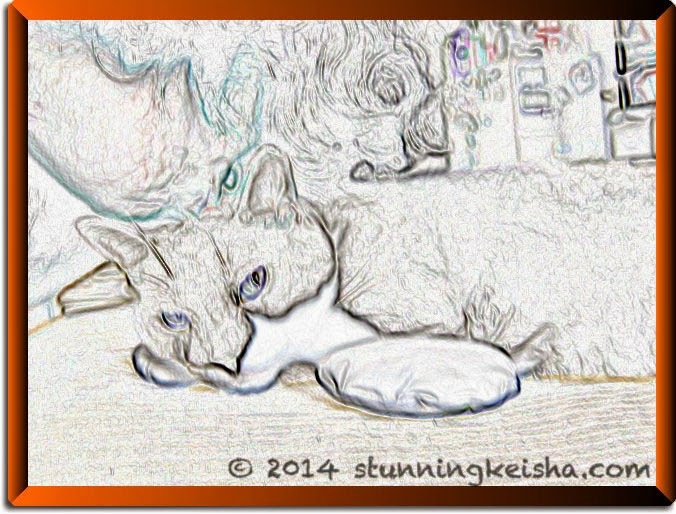 I decided to use one of the pictures from the selfie shoot as my entry in Athena and Marie’s Caturday Art Blog Hop. (Click the link to see the other entries.) I have tried to disguise the innocent (me) and hide the ugly (her) as best I could. Hmmmm, I can still make out what that scary pink blob is. Time to try something more drastic. That blob is still there. Drastic times call for drastic measures. Take that TW! Next time respect my private space! MOL - it took some effort, but I believe you have finally rendered TW unrecognizable! You know, darling, I can hardly believe I am saying this, but honestly, I think your picture with TW kissing you is adorable. You look very happy and content. Maybe you should just go with the flow? Damn--where *is* my mojo???? LOL pink blob but CK your selfie is pawsome. We have to say we like it. Have a super Saturday. Hahahahaha! Good work getting rid of the blob. LOL. Love each one of your art images. They loll look pawsome! I do love your stunning selfie CK! We really love that last version. Sorry your space was violated, CK, and then posted for all to see. Wow CK... that was drastic... we are feeling just the tiniest bit bad for CW! Purrs from the Zee and Zoey gang! Awwww! CK!!! Ugly? Your poor human! The pink blob thing was funny though! BOL!!! That last photo is really neat!!! You did a great job of hiding the pink blob and bringing the focus of the picture to yourself. You did a good job disguising the pink blob and even keeping yourself recognisable. It is beyond embarrassing when they insist on kissing you and then make it public. That's one extreme close up! Nothing like looking right in the lens. I would love to get a selfie of Truffles but she hasn't been that cooperative! TW kissed you on your head ??!! That's cool CK. One of these days M will get her act together again and maybe we can join up. That's a great selfie of you and TW, CK. And cool effects, too. Though you don't look real happy. ...you know, we kinda like the pink blob. She looks like she might be good for a treat or two. Great selfie. At least you didn't have a selfie that included the human litter box in the background. CK, you are so funny! We love your selfie and wonderful to see TW giving you a kiss, we hope you didn't give her the bitey! Great photos, even with the pink blob! We don't think your feeds are making it to our reader...maybe if we try adding again! 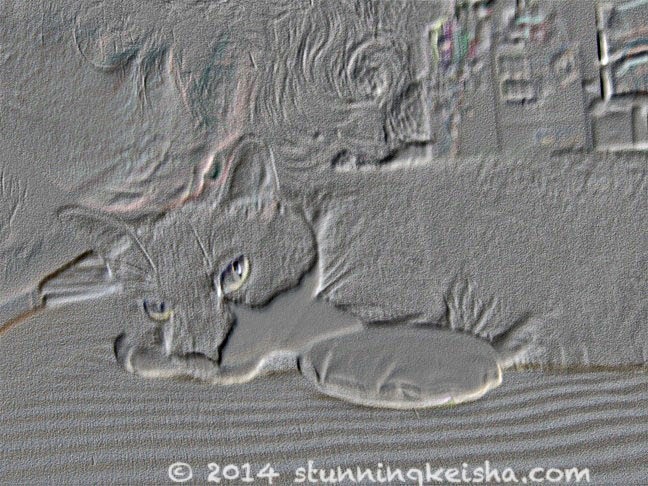 Our human wants to ask your human about your asthma, the Pred, etc., will see if she can find an email addy for you. Thanks. Of COURSE she could have taken that selfie, herself. Firstly, that IS the nature of selfies. Secondly, she's a cat. Means she's smart. 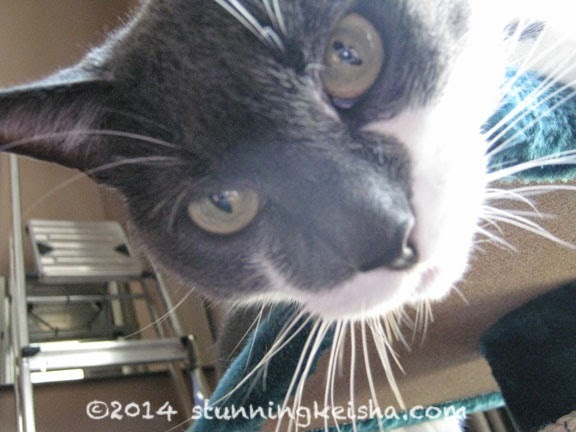 OMC, my secretary did a co-selfie with me the other day too! I was asleep so I couldn't escape! These humans are getting out of PAWS! MOL CK! You surely feel violated, we can TELL! Though we do think that last one reminds us a bit of sand sculptures! Oh my gosh, this had me laughing out loud! XD You sure went to some great lengths to hide poor TW!